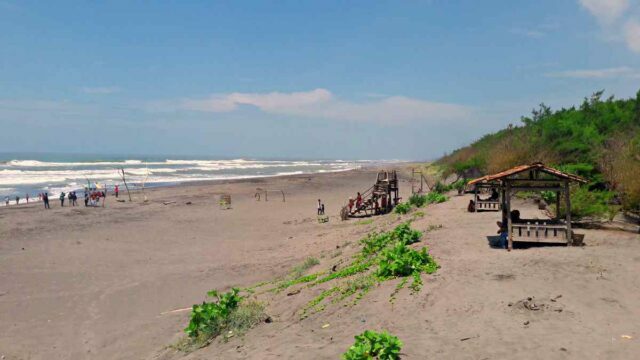 Gumuk Pasir Parangkusumo is coastal sand dunes located at Bantul, Yogyakarta. 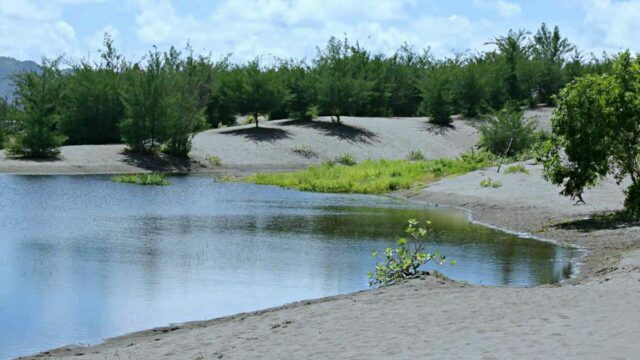 Parangkusumo sand dunes stretch for 2 km from Opak River to the famous Parangtritis Beach. It’s the one an only coastal dunes in Indonesia. In fact, there are only three coastal dunes in South East Asia. The Gumuk Pasir Parangkusumo, in the Philipines (La Paz Sand Dunes). And Vietnam has Mui Ne Sand Dunes. The sand is a product of volcanic activities of Yogyakarta mountains, Merapi and Merbabu. Opak River carries volcanic ashes which then are carried by air to Parangtritis Beach. Wind and waves then erode the fine grains and pull them over the shore. This process happened from a long time ago and still going. Scientists even say that everyday Gumuk Pasir Parangkusumo is only getting wider. The climate of Gumuk Pasir mimics desert climate. It is very hot at day and the temperature drops significantly at night. Nowadays Parangkusumo sand dunes fascinate both tourists and scientists. The most popular leisure activity to do here is sandboarding. Meanwhile, scientists continue to study this phenomenon. 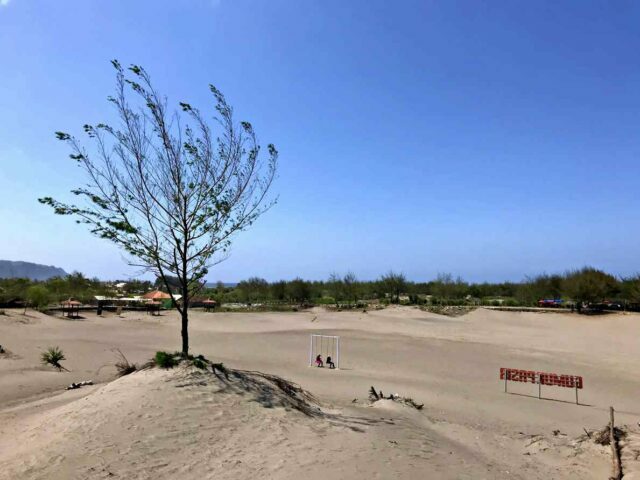 To add the fascination, Gumuk Pasir Parangkusumo is of barchan type, a type of coastal dunes that are supposed only formed in an arid climate, not in a tropical climate. Imagine snowboarding when thinking about sandboarding. Both are pretty much similar, only the location is different. 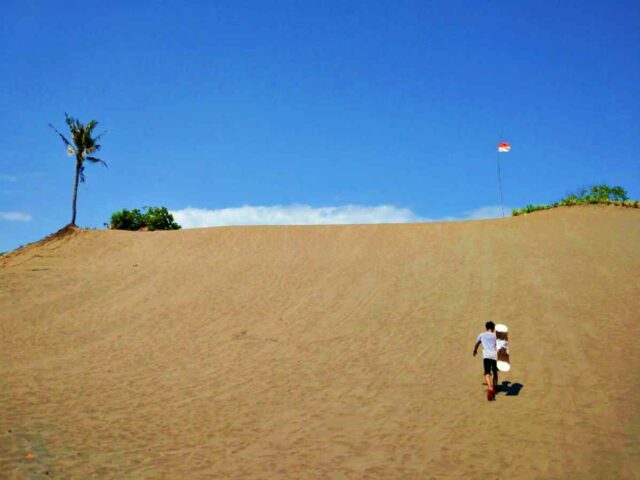 At Gumuk Pasir Parangkusumo, even a beginner can start sandboarding right away. With a cheap rental fee of IDR 70,000. Not only that visitors will get to use a sand-board at an unlimited time. But there’s also an instructor to provide the basic how-tos. 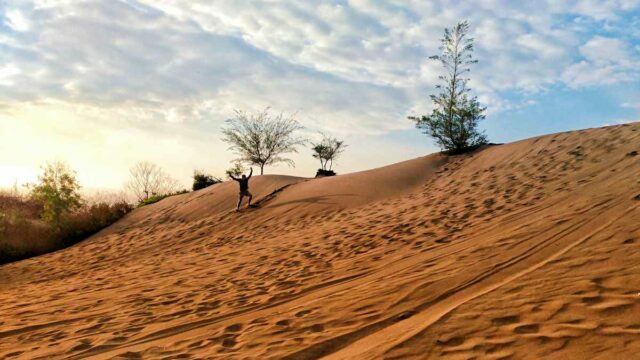 Gumuk Pasir Parangkusumo is the only place in South East Asia where tourists can sandboard. Due to its barchan type, the dunes can reach a height of 5 meters. They make a challenging sandboard track. The 2 km long area is also perfect for sand-skiing. Attached to the back of a jeep with a rope, get pulled and have fun sliding! Usually, it’s an oasis in the middle of the desert. It’s the other way around at Parangkusumo sand dunes. Imagine a green tropical setting, in which a random desert suddenly put in the middle by nature. Gumuk Pasir Parangkusumo is very unique like this. As visitors walk around the sand dunes, notice that the place is surrounded by wast rollings green hills. The sand dunes seem out of place. Walk until the edge of Gumuk Pasir, people likely will see green shrubs, villages with fields, and a small forest. On rainy season, a pool of water formed on some spots. Green trees nonchalantly grow here and there, since it may look like a desert here. But the soil is actually still fertile. 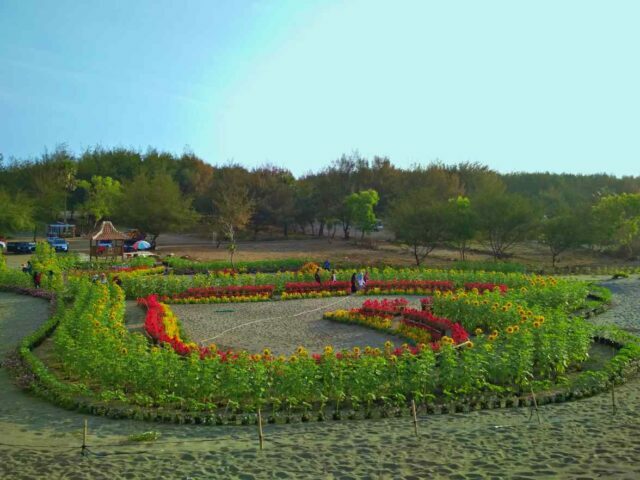 There’s also a flower garden planted on the sand by locals. A beautiful sunset is one of the things to expect at Gumuk Pasir. Enjoy an unobstructed view of the sun making its way home toward the horizon. Twilight hunters will love the gradation of the sky, from blue to reddish. The desert that extends wide turns into a black silhouette. Far away, sounds of waves coming from the beaches nearby. Evening time at Parangkusumo sand dunes is breathtaking as it is peaceful. The most famous beach in Yogyakarta, Parangtritis Beach, is only 5 minutes drive from Gumuk Pasir. Join with the crowds of beachgoers sunbathing, swimming, or simply playing with the waves at Parangtritis. Depok Beach is also a 5-minute drive to the opposite direction. The beach is famous as heaven for seafood. The fish market here sells a variety of sea catch much cheaper than in the regular market. Short at a time, worry not, catch a glimpse of the waves nearby. The nearest beach to go is Barchan Beach. It is still in the same spot with Gumuk Pasir Parangkusumo. Just need to cross the street. The beach is much less crowded than Parangtritis or Depok, sometimes with no tourists at all. It’s a perfect place to get some solitude. Parangkusumo sand dunes open daily from 7 AM to 6 PM. Visit early in the morning to avoid midday's scorching heat. Other best time to visit is around evening for sunset. Prepare a hat, sunblock, and sunglasses. See: Experience the extreme gondola ride in Timang Beach. Admission to the site costs IDR 10,000 per visitor. There is a parking fee, IDR 3,000 for motorcycles and IDR 5,000 for cars. See: Seafood feast & activities in the white sand Indrayanti beach, Yogyakarta. Facilities at Gumuk Pasir Parangkusumo are quite adequate. There are public toilets, parking lot, and security post. Many nearby stalls sell food and refreshment. As for accommodation, since it's close to many famous beaches. Visitors can expect plenty of hotels and guesthouses around the area. The rate can be as cheap as IDR 150,000 for a night. Parangkusumo Sand Dunes is quite easy to reach from downtown. It's a 50-minutes drive southward. Just follow Parangtritis road to Parangtritis beach. However, on Parangkusumo intersection – besides Gadung Parangtritis Hotel – turn right toward Depok Beach direction. Parangkusumo sand dunes only around 850 m from the intersection. Renting private cars or motorbikes provides flexibility. For those willing to explore nearby tourist spot. Renting a car costs around 400,000/day while a motorcycle costs IDR 65,000/day. As for public transport, tourists can take a Trans Jogja bus heading to Giwangan Bus Station. Transfer to a bus heading to Parangtritis beach. Stop at the intersection and continue with a motorcycle taxi.